1. Heat the vinegar and water together with the sugar in a saucepan until the sugar has dissolved. Remove from the heat and leave to cool completely. 2. 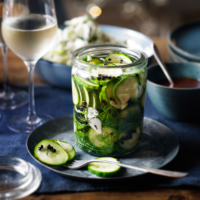 Slice the cucumber and pack it into a sterilised jar with a lid. Add the bay leaves, peppercorns, dill and garlic. Pour over the sweetened vinegar, seal and leave to pickle for at least 1 hour, or preferably overnight. This recipe was first published in Tue Dec 09 16:39:00 GMT 2014.